Use only use what is necessary to prevent damages. Choose recycled and recyclable materials. Re-use as much as we can. Don’t be surprised if your order arrives in randomly branded box! Make it easy to dispose of our packaging responsibly. Please see our Recycling Guide below to learn what you can recycle. Undertake rigorous research to make sure we’re doing the right thing. Read what we have found out so far. Strive to improve whenever we can. We know our packaging still isn’t perfect, and are always trying to do better. Please remember your three Rs when reading this guide: reduce, reuse, recycle, in that order of priority. We’ve reduced our packaging as much as possible, using only as much as is necessary to get the product to you without damages or spillages. We re-use as many packaging materials as we possibly can – including shredded paper from the office to pack boxes. When something is recyclable it’s best to recycle it rather than to send it to landfill. We know that you purchase from us because you want the best for your home and the planet and future generations. If you want to reduce the environmental impact of your purchase even further, please follow this guide. Cardboard Boxes To keep everything together. Cardboard made from 100% recycled paper (if new) or re-used boxes. Re-use if you can, else recycle if your local council will accept them. Paint inserts To stop paint tins from moving within the box. Cardboard made from 100% recycled paper. Recycle if your local council will accept them. Shredded paper Extra paint tin protection in case of bumps. Previously used office paper. Recycle if your local council will accept it. Polystyrene Extra paint tin protection in case of bumps. 6 – Polystyrene (PS). We never buy this in, but will re-use it on the rare occasion it arrives here. Re-use if you can, else recycle if your local council will accept them. Clear plastic bags Paint tins: If the paint does get dropped the plastic bag will contain the spill. Insulation: To protect the roll as it travels to you. 4 - Low Density Polyethylene (LDPE) Recycle if your local council will accept them. Some larger supermarkets also accept this type of plastic. Courier bags They help the Couriers deliver the order quickly. Recycle if your local council will accept them. Some larger supermarkets also accept this type of plastic. Clear tape Keeps it all together. Can’t beat the strength of this tape especially for heavy boxes and on plastic bags. Possibly will be taken out by the recycling process. However to be safe check with local council or remove from packaging. Brown tape To stop strapping from snagging or from being used as make-shift handles. Paper Recycle if your local council will accept it. White Fragile/This Way Up tape So the Couriers know to be extra careful. Watch this Space: We are moving this to a paper version. Possibly will be taken out by the recycling process. However to be safe check with local council or remove from packaging before recycling. White banding strap Holds tins in boxes in case the box gets dropped in transit. Also used around some paint tins where Lid clips don’t fit. Recycle if your local council will accept them. Lid clips Hold lids on tins just in case the tin gets badly bumped or dropped. Galvanised Steel Recycle if your local council will accept them. Delivery note bag To keep the Delivery Information Sheet dry and safe. Paper one side, plastic the other. Recycle the paper side please. Padded Envelopes To keep smaller items safe in the Post. Paper outer, bubble wrap inner or re-used Envelopes. Please open carefully and reuse. Else separate the layers and recycle if your local council will accept them. Cord strap To keep wobbly items safe on the pallet. Cord strap buckles Ties the Cord Strap tightly. Galvanised Steel Recycle if your local council will accept them. Stretch wrap To keep palleted items dry, dust free and to stop items from moving around in transit. Recycle if your local council will accept it. Some larger supermarkets also accept this type of plastic. Pallets To make it easy to transport heavy or bulky items. Wood. The pallet will have been re-used many times before it reaches you. If you cannot re-use it yourself, some of our Couriers will take them back for re-use – so it's always worth asking them if you are around when it is delivered. Or please offer it to people local to you via Freecycle or similar group. Gardeners love a free pallet! We send out 100’s of parcels each day, a lot of which are liquids (paints, oils etc) . It is of paramount importance to us that we remain a sustainable company no matter what cheaper alternatives there may be. It is our desire to offer great service with an environmentally friendly approach to everything that we do, including packaging. It’s a balancing act. Sending liquids through busy, often automated, Courier Depots and in transit vans has a relatively high level of risk. Our packaging process has been developed over many years experience. The mess if a tin were to get dropped, bumped or in anyway leak on it’s way on to you would be dire. 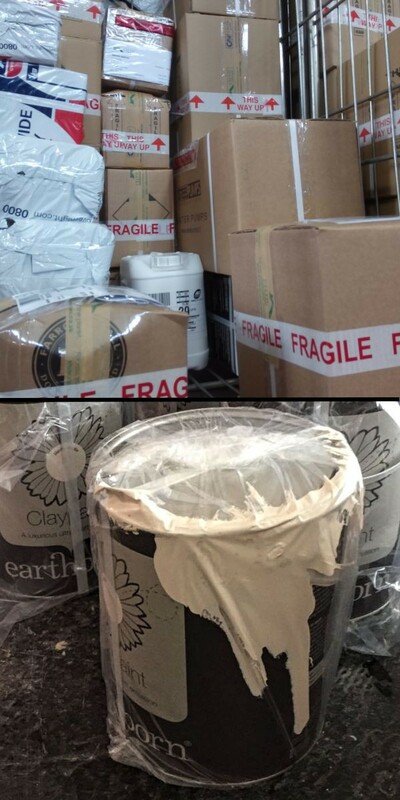 The potential damage to your home and clothing when you open the package, the paint leaking all over the Courier van and other people’s post. The cost to us of getting a replacement tin to you. The time cost when you are expecting to decorate the next day. The environmental cost of having to do everything twice. When it goes wrong, it tends to go very wrong. So we have done a great deal of research into ways to pack stuff well. In the few cases where a tin of paint is dropped in transit, the paint is usually contained within a plastic bag. "Sending an alternative compostable bag will make no difference to recyclability as it requires the customer to separately sort and compost the bag and it is likely that there will be contamination to the existing recycling schemes as the bags will be incorrectly placed in the plastic recycling stream. Domestic clients could take the packaging to their local supermarket (it can go in with the carrier bag recycling) or to their local CA site. "A page on your website may also reinforce recycling options and what the clients could do as the opportunity to recycle does vary widely across the UK." The take home message from WRAP was a page on our website about the materials and recycling options. So here it is! We are currently investigating thinner plastics bags that have equal strength to the ones we currently use (less plastic, same strength) and keeping our eye on oxo-degradable plastics as a possible alternative (although it is proving a difficult as there is lot of conflicting information on the web about it). How we are green blog post Feb 2018.